Chicken soup isn’t just good for the soul — it’s a powerfully healing food. When made with quality bone broth, it’s good for nearly every ailment. Nutrient-dense chicken broth is one of the few true whole food superfoods. From healing your gut, to warding off colds, to improving joint pain, high-quality, long-simmered chicken broth boasts an impressive laundry list of nutrients that are hard to find in many other foods. 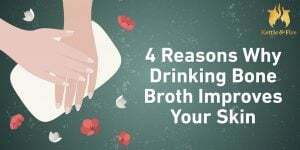 For starters, bone broth is an ancient food that was originally made by our ancestors to use up every part of the animal — including bones, marrow, skin, feet, tendons and ligaments — that were otherwise hard to digest. These animal parts are simmered along with other vegetables and herbs for several hours, even days, to extract a number of healing compounds, vitamins and minerals that your body can easily absorb. Chicken broth has more than 19 easy-to-absorb, essential and nonessential amino acids like arginine, glycine and proline, which are the building blocks of proteins and essential for digestive health, wound healing and detoxification in the liver. 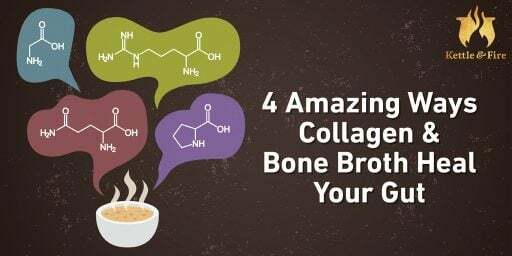 It also is one of the only natural food sources for collagen and gelatin, which help form connective tissue in the body. Lastly, it has a ton of nutrients that support digestive functions, immunity and brain health. Chicken broth helps sufferers of leaky gut syndrome. Leaky gut syndrome refers to a separation between the tight junctions of your gut. Your gut is the intestinal lining which creates holes that allow your body to reabsorb potentially harmful substances and waste that’s supposed to be eliminated in your stool. A leaky gut can weaken your immune system, cause food intolerances and cravings, create hormonal imbalances and lead to autoimmune disease like Hashimoto’s. Chicken broth helps because it’s full of glutamine. Glutamine helps repair holes in the gut lining so that it can once again become impermeable. This not only enhances digestion, but also boosts your immune system. Because of the natural collagen in chicken broth, eating or drinking it regularly can help restore cartilage in and around the bones. Chicken broth can ease joint pain that comes from getting older. Joint pain caused by conditions like arthritis can also benefit from daily doses of chicken broth, which also contains gelatin. Gelatin is the building block of strong, healthy bones, which can take pressure off the joints. It’s also what acts as the cushion between bones, making it a great addition to your diet. Chicken broth has been touted as the ultimate skin superfood. Some would even go so far as to claim it works better than botox. That’s because improving your skin begins with improving your gut. Collagen is the most important nutrient for skin elasticity. It’s is the primary structural protein of your skin, and is responsible for its plump, firm, youthful appearance. When collagen begins to break down because of aging or environmental toxin exposure, signs of premature aging like fine lines and wrinkles begin to appear. Other essential vitamins and minerals concentrated in bones, including zinc, are important for fighting acne and maintaining clear skin. One study showed that zinc has the ability to reduce the activity of P. acnes, which is the bacteria on the skin that can cause breakouts. Lastly, chicken broth contains glycosaminoglycans, which are molecules found in the skin’s dermis, along with collagen and elastin. Their role is to fill the space between collagen and elastin to keep skin plump and supple. Magnesium, which is found in chicken broth, is known as the relaxation mineral. It’s required for over 300 enzymatic processes in the body, including synthesizing proteins, transmitting nerve signals and relaxing the muscles. All of these functions can help improve sleep latency and quality. Getting magnesium through food as opposed to a supplement helps your body absorb more of it. So, chicken broth from mineral-rich, pasture-raised animals can help you get an easily digested form of the relaxation mineral right before bed. Turns out there’s actually something to having chicken soup while fighting off a cold or flu. Researchers found that the amino acids released when making chicken broth reduced inflammation in the respiratory system and improved digestion. These compounds can even help heal disorders like allergies and asthma. When making chicken broth, the bones must be simmered for long periods of time (between 18-24 hours) to allow all of the vitamins and minerals to be fully released. The long simmer time also makes these minerals bioavailable, which means they’re easier for your body to digest and absorb. This is especially important if you have a weakened digestive system. Homemade chicken broth is one of the best options because you can control what goes in it and how long it’s cooked. However, store-bought chicken broth can be just as nutritious as the homemade stuff. It all depends on the brand. A good bone broth congeals when cooled because it’s high in gelatin. When shopping for broth at the grocery store, make sure it’s chicken bone broth or beef bone broth and not chicken stock. Then figure out how high the collagen content actually is. Chicken broth or beef broth made from grass-fed animals and organic vegetables will also have a higher nutrient content. Low-sodium is always a good option as it allows you to add the right amount of salt. Large brand, like Swanson Chicken Broth, have various options. Kettle & Fire’s bone broth is slow simmered for over 12 hours, helping extract all the nutrients your body needs. It’s also made with only organic ingredients and sustainably-raised, grass-fed animals. While the conventional way to use chicken broth is in a soup or stew recipe, you could actually add it to any recipe that calls for liquid. Swap water for chicken broth in egg dishes, meat marinades, stuffings, casseroles, smoothies and noodle dishes. Some people are even trading in their morning cup of coffee for a warm mug of bone broth. The daily serving size doesn’t matter as much as consuming it daily. Having chicken broth first thing in the morning will give your skin and gut a massive boost of nutrition. The abundance of amino acids, vitamins and minerals could also give you all-day energy without the jitters. We recommend making chicken broth a part of your lifestyle. To get started, check out this guide on how to drink it.